Are they cheaper without a pedigree? All pet kittens that are "not for breeding", need to be neutered when they are approx 6-10 months old. Why is my kitten a pet kitten? Morphologic or standard factors: even if the kitten is healthy and bears no genetic defects, it could be carrier for aesthetic defects which would be inadvisible to transmit to other kittens. The objective of selection is, after all, to produce the best. The breeder aspires to have the highest quality kittens. This implies that the same kittens could be sold as a pet by a cautious breeder and as a show kitten by a breeder who is not careful or who doesn’t know the standard of the race. Factors related to the genealogy of the kitten: The blood lines are achieved by the breeder in years of careful and focused selection. The blood lines should not be dispersed in a myriad of more or less random couplings by the owners of kittens with the sole interest of having the experience of the litter. This dispersion lessens the value of the pedigree of the cats and devalues the years of work put in by the breeder. Factors connected to contractual conditions of the breeder: the breeder must respect any particular limits stated by the original breeder in the sale contract. One of the most common clauses forbids the breeder to sell the kittens of one particular stud cat without an NFB for at least two generations! This usually happens when the surrendering breeder who has sold the stud cat wants a particular breeder to work with his line but still wants to contain the propagation. In this case the breeder-owner of the stud cat MUST sell children and grandchildren of the stud cat as NFB. The responsibility factor: breeding specific breeds, helping the dam to queen, choose healthy males and females, avoid introducing consanguinity in the kittens, test the cats for breed hereditary illnesses before coupling so excluding any carrier, socialize the kittens, etc. All this is not easy to manage; you can’t learn it in a day. People enjoying the excitement of the litter experience often oversee these aspects or simply don’t have the necessary technical knowledge to take them into consideration. In order to avoid this falling back on the health of the kittens and possibly the adults, some breeders choose to give away their pet kittens, reserving reproduction rights only to people they trust. I have a pet kitten but I will still breed from it! If you decide to violate the agreement made with the breeder who sold you a cat you could completely lose the confidence of the breeder himself, who would have sold you a kitten on your word that this would be a serene and placid sterilized house cat. Cat shelters are already overcrowded with half breeds. I choose a breeder who sets no limits! Although it may seem annoying not being able breed from your cat, beware of breeders who give you the right to reproduce their cats without asking questions and without asking what your plans are. You are probably talking to someone with little interest in the creatures he is helping to bring into the world and who is more interested in the profit that can be obtained (a kitten sold with reproduction rights typically costs more than a pet kitten). I want a breeding cat! If you are sure that you want the responsibility of a litter, we suggest you say this clearly and immediately to the breeder you contact to purchase a kitten. 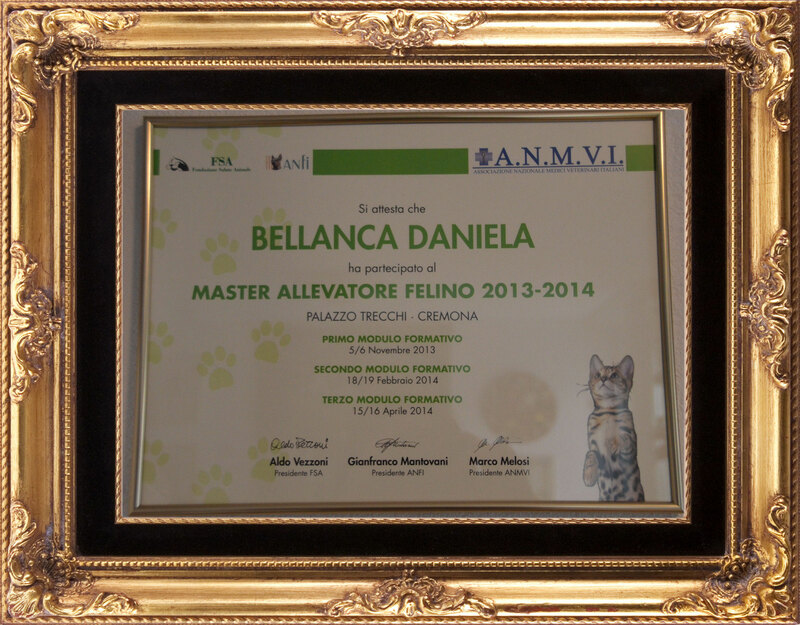 If he deems it appropriate and feels he can trust your good intentions, he will himself suggest a valid breeding cat and, thanks to his support and his advice, you will be able to enjoy this experience without any problems and without incurring any traumatic situations. With a little luck you might even get some splendid examples to show! Have the humility to admit that there are some things that require a skill that you might not have. Best avoid the situation in the first place.